Togo lies in the Dahomey Gap, the part of the forest-savanna mosaic that separates the Upper Guinean forest zone to the west from the Guineo-Congolian forest region to the east. Home to the easternmost fringe of remaining Upper Guinean forest, the Plateaus region has the second largest concentration of people in Togo, after the Maritime region where the capital, Lomé, is located. It was subjected to major deforestation as a result of the socio-political turmoil in the 1990s. Forests have always been rare in Togo, yet in rural areas, more than 80 percent of the local communities use firewood for cooking and fuel. The lack of sound forest management has resulted in overharvesting for woodfuel, building materials, and other forest products. Because the laws consider forest products to be equivalent to other agricultural products, management objectives tend to favor economics, rather than the ecological role of the forests (USAID, 2008). 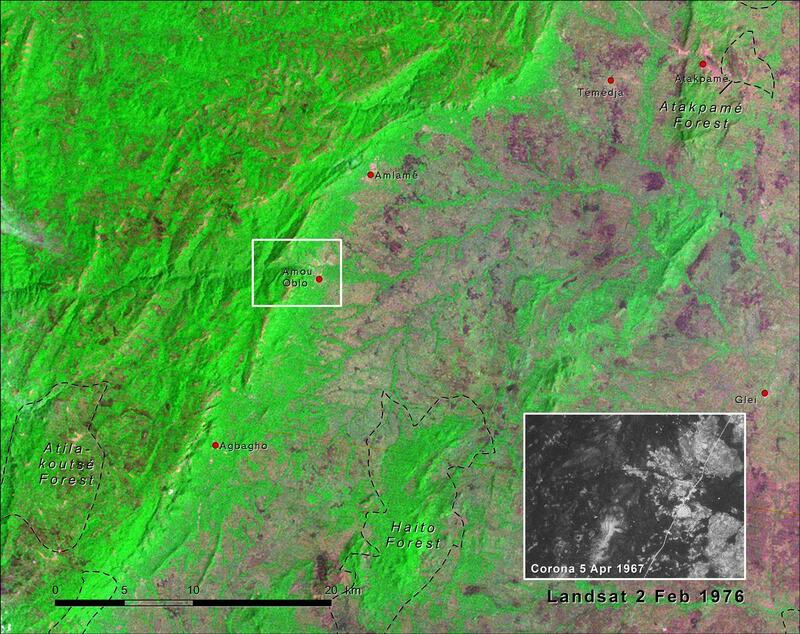 The pair of satellite images illustrates the drastic deforestation that has occurred over the past 40 years in the Amou prefecture of the Plateaus region, at the edge of the Fétiches Mountains range. In 1976, more than half the area was covered by forested habitats (28 percent forest, 22 percent degraded forest, and 3 percent gallery forest). Dense and degraded forests occupied most of the mountainous zones; a mosaic of savanna (43 percent) and cropland (4 percent), interspersed by thick gallery forests, blanketed most of the lowland. By 2015, unregulated use and exploitation had reduced forest areas by 76 percent, replaced mostly by savanna and degraded forest. Deforestation also occurred within protected forests, with major incursions from agriculture and growing settlements. Within the image area, cropland area increased by a factor of 11 between 1976 and 2013, and is now the dominant land cover. Cultivation of coffee, cocoa, and cotton, as well as subsistence farming, has cleared large tracts of land, replacing the semi-natural landscapes with large-scale commercial agriculture (see insets) (Tchamie, 2000). The gallery forests that followed lowland watercourses were decimated. 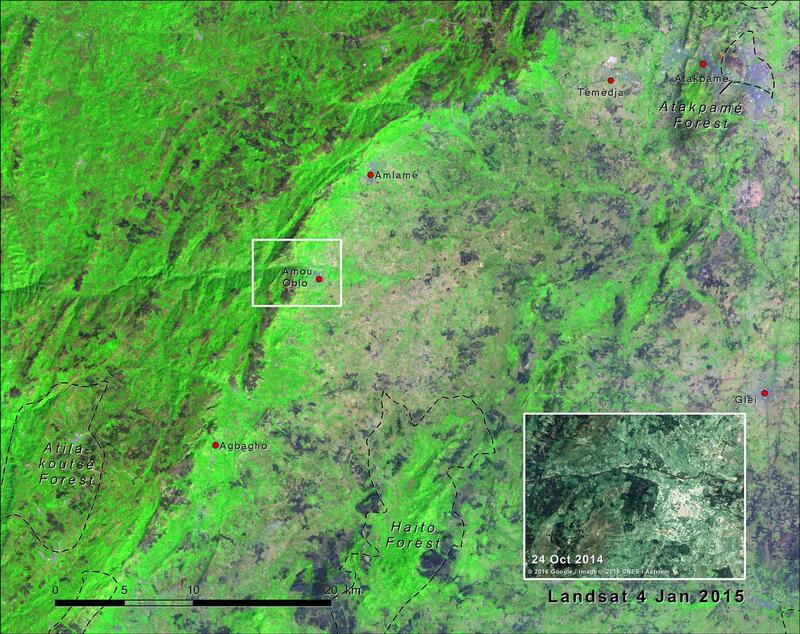 The darker areas visible on the 2013 Landsat image are burn scars from bush fires, ignited accidently or intentionally for such uses as agricultural clearing or hunting. Burning occurs over large areas each dry season. These fires can degrade forested habitats, reducing their suitability as habitat for wildlife. There are numerous forest“islands”throughout Togo, used by local people to perform ceremonies (Kokou, 2008). Many are considered sacred forests which also play an important role as isolated islands of biodiversity. The sacred forests are used for gathering firewood and medicinal products, and in some cases for hunting. Overexploitation of the sacred forests has reduced many in size and ecological complexity. Introduced species are replacing the native vegetation in some locations. Changing cultural and religious traditions are also leading to the abandonment or conversion of sacred forests to other uses, such as agriculture (USAID, 2008). Forestry development, bush fires, and intensive land clearing, as well as the abusive exploitation of natural resources for human consumption, trade, and tourism, together constitute the principal pressures on the natural resources in the Plateaus region of Togo (Tchamie, 2000). The government and local organizations are now promoting reforestation in the Plateaus region, but the trees being planted are often non-native, high value species, such as the teak and eucalyptus (Kokou, 2008). Despite these efforts, the deforestation rate remains high.